I started looking for a new belt kit as the issue kit that I had previously never really fit me properly and I wasn’t quite able to fit all of my kit in (and still be able to get it out!). In the past I had tried using other guys stitched ‘airborne’ style webbing however I wasn't particularly comfortable with the fact that if a pouch ever broke in any way that was you diffy a pouch. For this reason I had moved to a Molle belt set up using mainly Issued Osprey, Blackhawk and Warrior pouches. As I’m sure you are all aware the issue molle belt comes in only 3 sizes. This is fine for a generic catch all belt for the entire army however for most people it never quite fits right. British Tactical however are amongst a pretty small number of companies that offer a decent selection of sizes for their molle belts.With a choice of 3 heights (2, 3 and 4 rows of molle) and 5 width (18, 20, 22, 24 and 26 molle column) sizes, as well as 3 buckle types, whatever your body shape or size you will be able to find a base that will fit you perfectly. In the end I decided on the small (18 column) 4 row molle belt with a roll pin buckle. The reason for this was I had found with my old 3 row molle belt the bottom of my pouches had a tendency to rub my legs raw where they overhung the padding of the belt. Straight out of the package the belt felt sturdy, well made and with a decent amount of padding. The roll pin buckle and belt do their job perfectly and has plenty of room for adjustment so if I am wearing multiple layers there will be no problem with the belt fitting. My only slight niggle with the belt is that there is no way of locking it closed. If the buckle catches on anything the belt will undo itself, this however is a simple fix with my unit tailor adding Velcro to the belt to prevent this from happening. British Tactical makes 2 types of ammunition pouch, double and triple magazine. Both pouches are exactly the same design the only difference being the size. 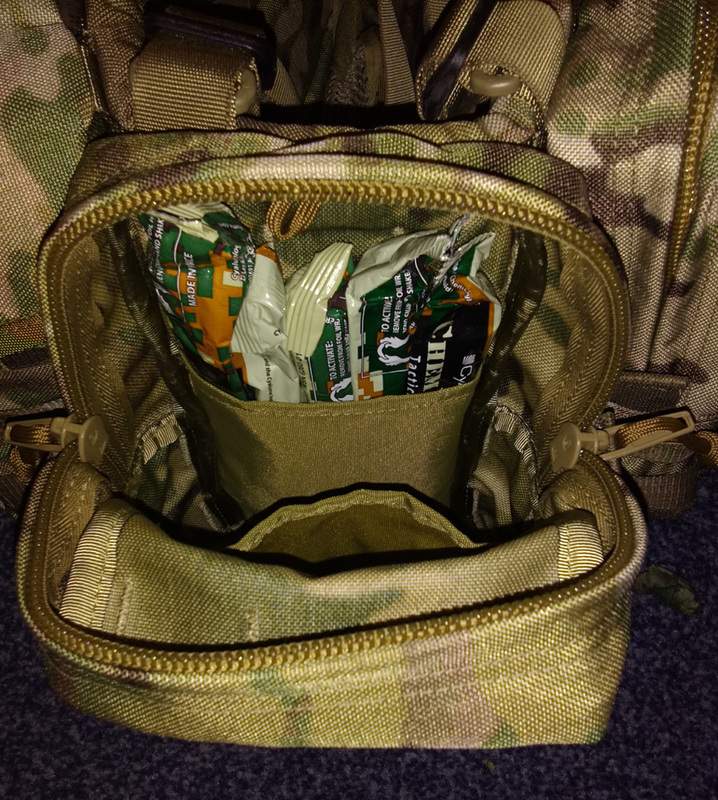 In reality I think that the double magazine pouch is redundant, as with the addition of the adjustable elastic drawstring on the side of pouch you can adjust the triple mag pouch to hold 2 or even only 1 magazine easily, for the extra £3 the triple pouch gives you much more versatility. To my mind there is no competition when it comes to these pouches. They are made exceptionally well and easily customisable. The top flap of the pouch is adjustable with Velcro on the inside of the pouch allowing you to set the height of the flap, this allows you to hold several sizes of magazine as well as smoke grenades and to a lesser degree a thermal mug! The Large Stealth Admin Pouch by British Tactical is designed to sit behind their large utility pouches or 2 ammo pouches. It has a molle footprint of 4 wide by 4 high with an attachment for each loop it covers, this gives the pouch an incredibly strong attachment to your molle belt and allows you to double mount even 2 full ammo pouches without any risk of failure. The pouch itself only has a capacity of 0.65ltr, however this is more than enough for my needs. 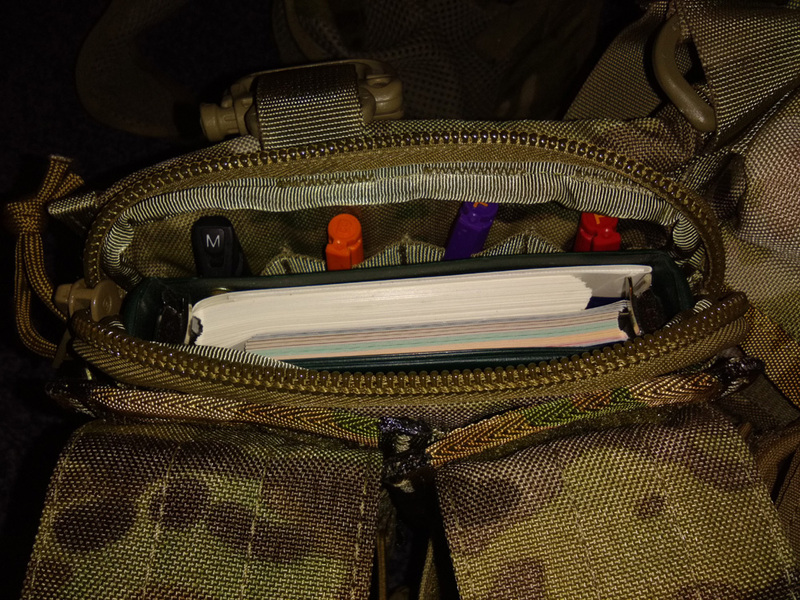 I easily fit my commanders kit (lumicolors, notepad , AATAMS and aide memoir cards) in this pouch, to my mind this is ideal as I now have to carry less in my nirex and those essentials are always to hand. A brilliantly thought out pouch and one every commander will find incredibly useful. Using the pouch added maybe 1.5 inch depth to my ammo pouches. Having said that I’ve had no dramas with accessing my magazines and in all honesty probably find it easier getting at them as it has put the pouches directly at my hand when I stand normally. The Medium Lidded Utility pouch is British Tacticals’ take on the classic utility/water bottle pouch. Size is an issue for me here, I have struggled with utility pouches that are too small to fit my emergency cooker, metal mug and water bottle. This however is not an issue with these pouches, at a massive 2.4ltr capacity, there is more than enough space to fit in all 3 of these items as well as extra fuel and a main meal. For a pouch that has a molle footprint of only 3 wide by 4 high, this is impressive. The pouch itself is reinforced in the high wear areas around the opening and seams to give the pouch longer life. When you buy this you get the option of adding molle loops to the side, front and top of the pouch. Many manufacturers do this with their pouches and claim that this allows you to double mount other pouches directly onto them, however I have found a lot of these fail in doing so. Either the pouch doesn’t have enough molle loops or the strength of the pouch is just not up to the job. I don’t want to mount a lot onto the pouches however I do need a place to attach my dump pouch. I went for just the side molle option for an extra £1.20, which in the grand scheme of things is nothing. 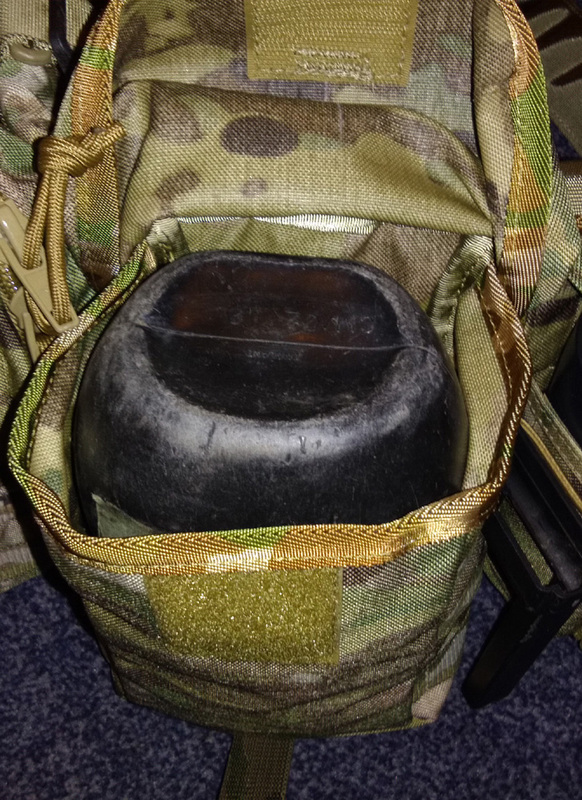 When I attached my Warrior dump pouch to the Medium Lidded Utility I was pleased to find no problem with the number of molle loops and the pouch itself was more than strong enough to support the pouch even with me ripping it open under contact. For me the main concern with zipped pouches is the added peace of mind they offer with regards to security. There is realistically no way that you are losing anything out of these pouches unless you physically forget to do the zip up. British Tactical have again excelled with their Medium Zipped Utility, with large hardwearing zips and the same build quality as all their other pouches you get a lot of pouch for your money. A slightly smaller capacity than the Lidded version (2ltrs), the same molle footprint but considerably lighter this is an ideal pouch for the less frequently used items such as your Mine Extraction Kit and model kit. Personally I have managed to fit 5 cylumes, PMEK, model kit, blister/first aid kit, FFD and my rifle sling in this pouch with ease. Inside there are 2 smaller pouches to help with kit separation and personal admin. 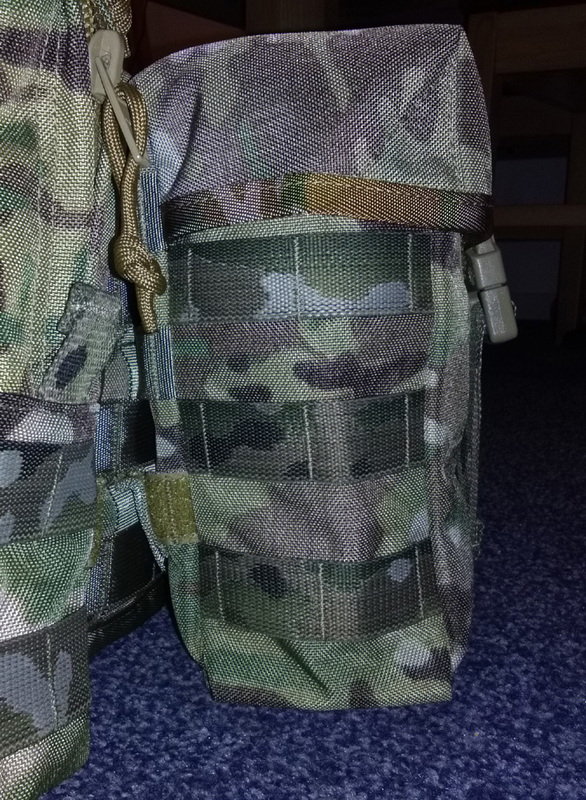 All the zipped pouches come with molle fitted on the front and sides to allow you to double mount pouches, I don’t need anything mounted on them so haven’t tried it. I have been incredibly impressed with British Tactical both for the quality of their products and their impeccable customer service. The day after placing my order I received an email from Dave Stewart thanking me for my order and to check my belt size in order to ensure the molle belt fit correctly. From the time I placed my order to when I actually received it was a grand total of 11 days. Considering the website advises 7 days for the manufacturing and dispatching for each order, the fact that I am currently serving overseas and my order was sent via BFPO, I think this is a fantastic turnaround time. 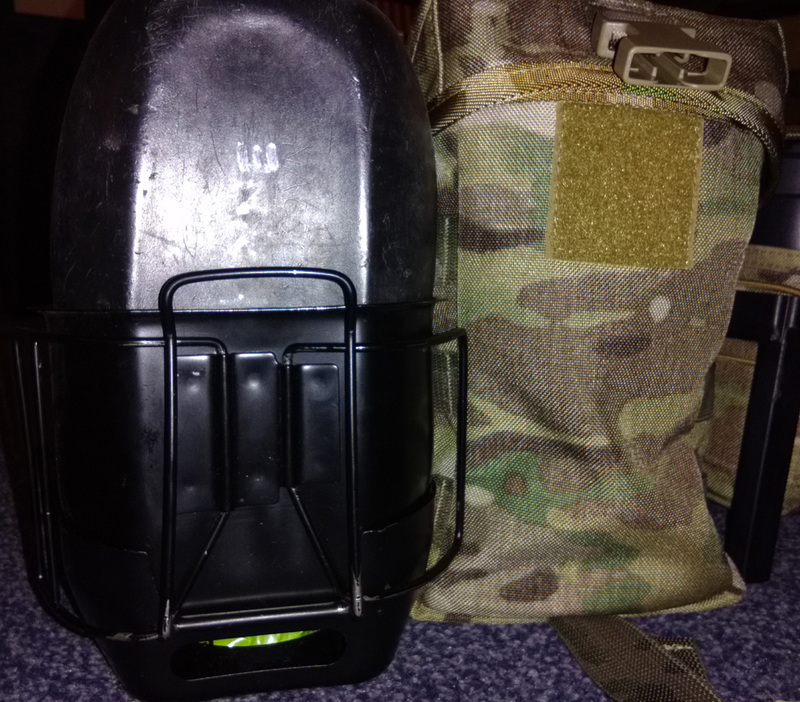 Overall I would recommend British Tactical products to anyone I work with as it stands out head and shoulders above most of its competition, granted they are slightly more expensive than other places (you may end up spending £20 more with them), however the quality and service they provide more than makes up for this. Well done British Tactical keep doing what you are doing!